Kavit Haria makes his money with email. Who better to have on the show than someone who makes most his income from email marketing? Kavit very well could host his own Email Marketing Podcast if he really wanted to..
..that’s how good he is. 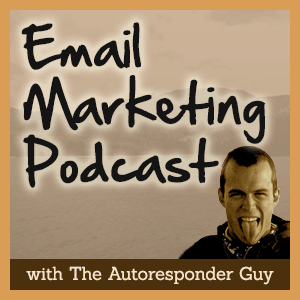 So on today’s show, we talk email marketing. We talk strategy, tactics, step by steps and more that give you a glimpse inside a true email marketer’s dragon’s layer. But you WILL come away with tons of gold. …will be a gazillion times easier. Kavit believes that email is a form of self-expression. Listen in and learn kavit’s 3 main list-growing methods that you WILL earn money by following..
Hi, it’s John McIntyre here the Auto Responder guy and it’s time for episode 102 of the McMethod Marketing Podcast where you’ll discover one simple thing. How to use an automated marketing system with email to convert your leads into customers on autopilot while you sleep or play with your kinds or hang out entirely and ride motorcycles like me. Today I’ll be talking to Kaveat Harrier about a bunch of stuff actually. He’s been doing some really interesting stuff with the business and he sent me an email out of the blue one day just saying that the way he’s generate the most amount of revenue in his business is email marketing. I thought that was interesting, these people talk about social media and then these different things like that, but email is still king. You know, you have all these other things going on but email is really that device that’s—I don’t think it’s going anywhere either. Unless we all start doing email with Facebook or something like that, but then it’s still email it’s just email on Facebook. So email works and that’s what Kaveat’s on here to talk about. He talks about how to get from idea to business, going from a raw idea to a six figure business very, very quickly in the first 12 months and how to do that with email marketing, how to plug it in. And also he talks about how he’s doing it in his business right now. How he’s using email marketing to generate huge windfalls in his business. To get the show notes for this episode of the McMethod Marketing Podcast go to themcmethod.com/102. Now three things, as always, before we get into the interview, I’ve got one review I’m gonna start with that today. And the review is from The Fifteenth from the United Kingdom and it’s five stars and it starts like, “Holy Cow! So good! I found this podcast because I wanted to hear from Neville Medora but I had it on auto play so I continued listening while I was doing the chores and my God! This is easily the best podcast I’ve found on the subject of copywriting and marketing and that’s what I do. It has a huge wealth of information. I’ll be downloading the show notes for many of this, it has made me rethink my marketing and inspired whole new methods and avenues for me to go down. And it’s the only podcast in my subscriptions that I truly can’t wait to hear the next episode of. Check it out [02:00] before you do anything else.” That’s an epic review. Now I hope, The Fifteenth, if you listen to this podcast you’re a great—I don’t even know if it’s a guy or a girl, you’re a great guy or a girl or both, whatever you happen to be. And thank you a lot for the review, since I’ve got a massive smile on my face right now. I’m jumping up and down, doing cartwheels and I really appreciate it though, ok. If you wanna leave a review, if you wanna make my day, head over to iTunes, search for the McMethod Marketing Podcast and you will find it. Leave me a review, leave your website too if you like. I can even, you know, and then I’ll read it out on the show. Make you famous, give you some groupies like I did to Sean last week. That is that, now this week’s McMasters insight of the week is stories something I’m gonna keep coming back to. There’s a reason for it and that is stories work, stories sell and if you don’t know how to tell stories you’re really handicapped when it comes to your marketing. This is Gary V and this is why all these kind of guys they talk about stories being the linchpin of good marketing, ok. So you owe it to yourself to learn how to write stories. And that’s why I’ve got a training program inside McMasters which is all about How to Write Stories That Sell, that’s literally the name of the product. The idea is very simple, you can start with an idea like, “Well, there’s a green smoothie next to me right now,” and that’s the start of the email and then you say into some pitch, I’m basically talking about, “That was great green smoothie, its got blueberries in it and you know what, you know, green smoothies reminds it’s all about being healthy. ‘Cause you know if you wanna do good in business you gotta be healthy and you keep—this is gonna take a little while, but you keep following through that before another episode where you keep taking the story like that and you finish up by saying something like, “And that’s why I’ve created this three part health training program inside McMasters which is gonna, you know, show you all the hot entrepreneurial secrets to health and wealth.” Something like that. That is the idea. So that’s this week’s McMasters insight of the week and last but not least is if you’d like some personal one on one attention for your campaigns instead of writing it yourself, instead of listening to the podcast, I can do it for you. But you have to email me, you have to let me know, the spots go very quickly so shoot me an email [email protected]. We’ll hop on Skype to have a quick chat this week or next and see if it’s a good fit. And that’s it for now, today. Let’s get into this interview with Mr. Kaveat Harrier. It’s John McIntyre here the Auto Responder guy. I’m here with Kaveat Harrier, a guy from London who I just got on the phone with. He emailed me a couple of weeks back, right. And it turns out he’s in the—obviously he’s in the internet marketing space, he’s doing some just a business space. And he’s got some really cool stuff that he’s up to, one of the things, one of the most interesting parts of the email he sent me was that the most successful way he’s been able to generate business for or generate sales for his own business has been with email marketing. So he’s gotten very good at using email, you know, using email to drive sales. And what I find really interesting that talking to all these different people like this is it often comes back fundamentals but it’s also, everyone’s got their own slight spin on how they wanna do it. And I think it’s—you know, one thing to take away is there’s no perfect way to, you know, write an email and make money or even just to build a business. That’s a question I get a lot—I think it’s a question anyone who’s in the business of helping other people grow and build businesses is gonna, “What’s the perfect way to do this?” It turns out there is no perfect way there’s just a bunch of different ways that you gotta try and test and see what works. So anyway, today we’re gonna talk about some of what’s—a bit about Kaveat’s business, what he does, what he helps people to do. Which is essentially, from what I understand, is to take someone from idea to a business and then do six figures in the first 12 months. He’s got a pretty cool service he’s operating and I love this idea of email marketing being the biggest sales driver. So we’re gonna go in a couple of different directions here and see what happens, have some fun. Kaveat, how you’re going man? Kaveat Harrier: Yo, really good. Thanks for this. John McIntyre: Man, thanks for coming on the show. It’s always good when I get, you know, emails out of the blue and someone says, “Hey, I’ve been listening, we never chatted before but here’s what I do and here’s, you know, something’s worked for me with email and marketing.” It’s just crazy, man how small—not just how small this world is sort of like who comes out of the crack sometimes. Kaveat Harrier: Well yeah, as I said to you, I think I’ve been listening to this way before you developed it into something really pretty amazing. And I remember you were talking at that time about, you know, driving around on a motor bike and also some things Thailand [laughing] and it was really quite interesting. I got to hear a lot of different advice and insight sort of—it’s pretty cool how you’re really nicheing very well, very well as the Auto Responder Guy. That was just, you know, whenever I’ve had time listening to some of these podcasts and they’ve been really, really good so I gotta reach out and share what I have. John McIntyre: Good to hear, man, appreciate it. Well before we get into like the, I guess, the nitty gritty of what you’re doing with email marketing and some of the business stuff, give me a broad picture overview of, you know, what you’re doing. Kaveat Harrier: Which is an Indian drum. I don’t know if you’ve ever seen it but it’s really cool, you should Google it later. John McIntyre: I’m Googling it right now, the Tabla. Kaveat Harrier: So I had a really good musical career and I realized at that time that people were finding me, you know, playing music because learning how to gig, learning how to promote my music. I was doing some really good stuff at that time. I was mixing and doing music with like Western music, I mean, my background is that I’m Indian but I’m born and brought up in the UK. So I was doing that and then I realized that I had some knowledge here and I had a couple of friends who were doing some stuff online so I started to package it all together and share it. I wrote eBooks, I wrote video courses, I’m trying to tell this to you very quickly but I put all that information together into a business and I was selling all this stuff online. And, you know, what happened was at that time I learned about email marketing that was the first time I ever did it. And I remember this service called Constant Contact, I’d signed up to them, I’d set up a, you know, newsletter fellow. I’d start sending monthly newsletters, people would read them, I’d get a lot of readership and it was amazing because I would send out one email and instantly I would get a huge amount of response because my email list was growing. And people were responding within, you know, the first five, six hours of me sending that email and this is to people that I have no idea who they are but they were coming to me for advice. So I guess that really, really opened my mind and it went well for the first four or five years of that business. Which led me to do other things, I started to consultant other companies, I started to speak with lots of small businesses. And I started to develop my own second venture Insider Internet Success which is really all about helping somebody go from any idea they’ve got, you know, they want more time, they want more freedom taken from any idea they’ve got to implement everything that’s required to build that business and then to launch it. And then to give them whatever training that I can to help them get to six figures a year. John McIntyre: Nice. I like it, man, I like it. That was very quick, you steamrolled through that. I love it, I love it. It’s good. So we’ll talk to you about some of the email stuff like—that’s been working for you. I mean, you say you’re not really doing daily emails, you’ve kind of got sense that you’ve developed a bit of your own strategy that’s working for you. Kaveat Harrier: Yeah, I mean, you know what, I used to always—I use [infusion soft 08:37] as my main tool. And I used to write to—I have a list of about, you know, fifteen to eighteen thousand business owners and I write to them on a weekly basis, initially. And what happened was I would write to them and I would start to tell them stories, kind of in the Chapreon/Settle method and I wasn’t really finding my feet initially. And I found that if I could just stick to shorter emails and get across my story, I’d get a lot more responses. That was my theory at the time. And somehow it didn’t work, for some reason the shorter emails were not getting, you know, the same responses as the longer emails that I was doing. I would just write now, for example, and it would, you know, for however long I’ve got to write. I open up Evernote and write my emails inside Evernote and I’d write until I’m done. I don’t even stop, I don’t think to shorten them, if people are gonna read them they’re gonna read them, that’s my philosophy. But then what happened was I thought, “Well let’s see what’s happening with these emails if I do them on a daily basis.” Because I’ve been seeing a lot of people say try emails on a daily basis, you do it a lot also you use to say I can write on a daily basis. Although I got a few unsubscribes initially I didn’t really get that many people leave. In fact I increased my sales a huge amount more just because I was writing more often and I was therefore in people’s inboxes more often with really good quality information. The hardest thing of course is coming up with ideas but I think if you open your eyes and open your ears you can see them everywhere. I mean you drive down something happens on the road, there’s an idea to turn around. I read a lot of books so in there’s always ideas to turn around, whether it’s fiction or it’s non-fiction. You can take any of the ideas you find weave them in into an idea. For me, for example, I know that when people want to build a business online they wanna do it really because they want more freedom in their life, whether it’s time freedom, money freedom or anything else. You know the time to spend with their loved ones, the time to do things, travelling and most of my clients are really financially comfortable already. They don’t come to me because they’re looking for more money, although they’d love that, they come to me because they’re stuck in careers where they just don’t have the time even though they have really comfortable lives. So for them it’s about time. So in my emails I try to find out what are the things that I’m reading, that I’m seeing, that I’m looking at, that I can then turn into emails? And then I just write. I also try to put together a series of emails, you know, I think that’s really important for example, if there’s one, for example, this week, right now, as we’re recording this, one of the topics of the email series that I’m working on is called Straight-line Philosoview, it’s also a book, there’s a book called Straight-line Leadership and I got some ideas from that book. And I thought, “Well let me just take this book and write about it for a few days,” and so there’s different chapters, you know, and I’m picking little things from here and there. Literally just one line or two lines from that book, thinking about it myself and then just rumbling about, you know, how to get from Point A to Point B there’s a straight line but in this world we all seem to just zig zag and go around in circles before we get to B instead of just going the straight way. Well it’s the same for you if you’re looking for time and money freedom how much have you done so far and why are you not going in that straight line? Why have you been zig zagging and how have you been circling, and really the straight line option is open and clear. If you’d like to find out more then contact me. And I’ve always seem to end all my emails so far with, you know, here’s my phone number, here’s my personal email let’s just get in touch and that’s how I’ve received all of my business and more, more than I can handle. And sometimes there’s even a wait list if there’s—you know, because I limit the number of people that I’d like to work with. So sometimes there’s a waiting list because just of those emails that I write. But for me, what I’ve come to realize that in my business even if I don’t do anything today, the only one thing I gotta do is write that email. John McIntyre: Hmm. Would you ever consider out-sourcing that email? Kaveat Harrier: Well the funny thing is I’ve been thinking about that and I’ve been looking for people in the last, you know, couple of weeks, you know, whether it’s copywriters that I’ve been recommended to or Elance or specialist email people, I just don’t get the sense that they’ll give it a write like me [laugh]. I’m not saying that my writing is really good I’m just saying that the story and the persona that I built up and the way that I write, so long as somebody can replicate that a hundred percent then it’s ok. Otherwise I risk losing a lot of credibility with my list, and my list is where all of my income gets generated from, ultimately. Kaveat Harrier: So most of my stuff, I can definitely outsource in my business but that’s one thing that seems to be a little bit more trickier. John McIntyre: I feel like, you know, a lot of my own journey—there was this inflection point where this point where I sort of thought, you know, I can be a copywriter, you know, and then sort of just an internet guy with like a really small business. Or I can start to think like a businessman and an entrepreneur and think of building themes. And really means like taking my ego out of it and going, “What needs to happen to grow the business to free up my own time?” And more and more and more I’m like man—I mean it’s not—there’s no way someone’s gonna be able to copy your voice and personality or any of this like exactly. But is it possible to find somebody who can get a similar result, I reckon you can. It’s hard though, there’s this interesting like ego challenge, it’s a bit like, “Should I hire someone?” I kinda wanna do it myself, I feel like I should do it myself. Do you know what I mean? Kaveat Harrier: Yeah, completely. I think that when I started to think about outsourcing a few years ago the most important thing for me was to outsource everything except email. Just because I was responsible for writing the email because I knew that I could bring in the sales. I could bring in, you know, three to five phone calls per email, sometimes more, that would actually convert. You know, that’s a lot of money for me just out of one email. So every time I felt like I could let it go I was always hesitant to doing that. But you’re right, you know, you can find somebody to do it, at the end of the day there’s gonna be this period of time where maybe you’ll see some shifts in the number of unsubscribes just because there are new styles of emails but everybody will get used to it at the end of the day. So if that frees you up for an hour a day or half hour a day or 20 minutes a day to go and do something else. Whether it’s business related or not and you’re happier like that, the sure, it’s worth it. Completely. Kaveat Harrier: Yes, it’s a huge amount of time I think. I mean, I pretty much just do like five or six hours a day right now when I’m here. I travel a lot so sometimes I don’t even get that, sometimes, you know, it could go a month and I’ve already done like half hour worth of work. Kaveat Harrier: So for me it’s definitely a huge thing. I don’t actually send my emails I just write them inside Evernote and send that link to an assistant who basically proofreads and sends it off inside of VisualSoft, you know, they know what lists to send it to or what tag groups to send to and then they just mail it out. Kaveat Harrier: So for me it’s 20, 25 minutes of writing an email. If I’m really focused and I’ve got a really good idea, I’ll knock it out in 20 minutes. But sometimes I struggle, of course, like everyone does and I think that it can take longer, you know, when you don’t have a specifically good idea or you don’t have a focus. Which is why I try to batch my emails into weeks, I try to set up goals of, you know, what I want to achieve in this week with this email series? And then I just write, focused on that. I found that sometimes when you write on a daily basis and you don’t have weak plan of writing or a weak theme of writing sometimes you basically start a thread with somebody, you know. The reason, I’ll give you an example, the reason I did the Straight Line thing this week is because I did the first email, I had no intention of doing the whole week just on this topic. Kaveat Harrier: So that’s how I find my themes, I guess I look out for what really works, what people are saying, what people are responding to. I get a lot of response, I try to always get people to engage with me. Whether it’s by replying or whether it’s by completing surveys, which by the way, is not a big element of my work, and whether it’s just by reading a blog. And so long as people are engaging and, you know, I try to monitor what they’re engaging then I know what to write about. Kaveat Harrier: I guess the biggest challenge, John, is that you—I’ll write it, if I don’t have any specific thing to write about any theme then I just pick a topic for today and I pick a completely different topic for tomorrow, then every single day I’m having to constantly innovate. But I’ve tried to batch it all into weeks so I think it’s made it hugely more easier, I guess. This takes practice but starting with anything, any random idea whatsoever, and then as you write, the brain gradually sort of finds its way to point B. Which is if you wanna to be a craftsman or if you want to, you know, write great emails or if you wanna be, you know, build a business, you’re gonna have to approach it the same way a craftsman would approach making a vase. You’re gonna have to train, you’re gonna have to study, you’re gonna have to fail, there’s gonna be problems, you know, you’re gonna make a crappy vase days. Sometimes a vase is gonna break, but if you have a map, you know, if you have a blueprint then you’re much likely to be more successful. Just like if this craftsman is making a vase—if he’s done it before or someone is giving some instructions, like a recipe to make the vase he’s gonna be much more successful and that’s where my XYZ [inaudible 20:22] comes in. Kaveat Harrier: Yeah. Yeah exactly. John McIntyre: It makes it really easy. Kaveat Harrier: That’s the thing, I always start with, “What do I do I wanna achieve from this email? What is the one thing I wanna get from this email?” And I know it’s to get the phone ringing or to get email responses back. And then I lead unto, “Ok, well what are the most pressing issues right now that these people are facing?” I also know that, you know, but this is just if I was to break it down this is how I would do it. And then, you know, I guess they want more time, they want more freedom, they wanna generate more income, they wanna have something they can travel with, you know, a business they can run from anywhere in the world. They wanna do something that’s meaningful to them, they wanna do something they’re more passionate about and some of these people have been trying for years. Some of them are new to it, some of them have ideas but they don’t know where they’re going, it’s just really about finding the right stories to just, you know, share the story. And by the way, this is how this connects to this. I mean those three words by the way are so [inaudible 21:50] you could just use the words by the way after any story and link it back into what you’re doing, it’s really quite powerful. John McIntyre: Absolutely. It sounds like you’re making it sound really simple, man, I reckon there might be someone listening to this who’s thinking, “Look I have to write email and I tried sending stories and it just doesn’t work. I just don’t think it works, it just doesn’t sound reasonable.” So it sounds like what you’re saying is that you’re gonna have an opt in page, have an email list that you’re building, as long as you’re getting traffic to that page and people are signing up. You just gotta write some good stories, have a [inaudible 22:21], you know, and then some stuff and do the upsells and that’s it. That’s your business, that’s your six figure business right there, isn’t it? Kaveat Harrier: Well yeah, yeah. That’s just pretty much it, but let me break that down a little bit more. I guess that the one thing that people look for is a business that works where they don’t have to put in a huge amount of work but it still works. And I kind of call that the automated business system because it’s really about finding the right idea, finding the right product. And once you’ve got those two things, then creating a marketing and sales system—I have two different parts to it, I call the first one a 24/7 marketing machine and then the second part is the simple sales funnel. So that’s really all the 24/7 money marketing machine is and it really—the goal of that is just to get people onto your database. So if you do that at the most simplest level, without having, you know, later on you can have multiple reports, you can have multiple videos for different groups of people. You can start thinking about oh, I targeted this group, you know, and this group has, for example I talk with business owners and business owners have issues with time, they have issues with their website, they have issue with maybe they don’t know how to blog but they need a blog. Or they don’t know how to create video but they need to create video. You could have individual guides or reports for all of these things and give every single one of them away all leading to a specific landing page right? And into your email list. John McIntyre: That’s a great movie. Yeah, yeah, I know it. Kaveat Harrier: [Laughing] And in that Tom Cruise says, “Someday is code for never,” and it was really interesting. I heard that and it clicked to me and then I was writing an email yesterday, actually, and in that email I included the words: someday is code for never. Because I was writing about the fact that if you don’t do something now, you’re never gonna do it and if you don’t take action today, when is someday gonna come? Maybe, maybe, maybe is just not the way to do it. And I just remembered that I watched that film, you know, I had written that down because I always try to write things down if I hear them otherwise I’ll forget. And I used that. So just by that one line, someday is code for never, five words I just wrote an email. And I wrote, you know, I thought about that, I thought about what it meant and I try to write my own opinion of it. And at the end of the day there’s no or wrong with email, I’ve found that you can write whatever you want. I’ve written about radical stuff like levitation and stuff like that I’ve interest in and, you know, there’s no right or wrong. Some people like it some people don’t but you’re writing what you wanna write, it’s your personality, it’s your life, you can write about it and no one’s gonna say it’s right or wrong as long as you bring it up and connect it up with what you feel is valuable for them. At the end of the day if you’re just self-serving, you know, constantly, it’s not gonna work. But anyway, so you write these emails and then, you know, you direct them to—in my process what I do is I have the second segment, I try to create different segments it just makes life easier for me. But I have this thing called the simple sales system which is again about automating the sales process so it could be, you know, a webinar to a sales letter. It could be a sales letter or sales video, it could be any of these things with a payment system. And I’m using all my emails to direct people to those places where they can buy. Just like, for example, when you write your emails you direct people to your McMasters webpage, you know, they can read everything they wanna read about and then they can sign up to whatever group they’d like to sign up to there. John McIntyre: Yeah, yeah, yeah. I like it, man. I like it. Talk to me about the traffic, because I lot of people like when people like when it comes to this alright I got the emails, I know what I gotta do there but—and everyone’s got a different approach with traffic. Like someone’s got a [inaudible 27:12] have got some emails and any traffic, what do you tell them to do? Kaveat Harrier: It’s a really interesting thing and, you know, for a long time everybody seems to want to do Facebook and Facebook pages and Twitter and LinkedIn and all of the social media stuff and the thing about social media is no matter how much you—for me anyway, I guess there are people out there that make it work really well, but for me I just feel like it requires way too much time and involvement for me to actually see a result. And at the end of the day I’m trying to build a business where I’m hands off, it’s automated, you know. If you’re gonna sit there for hours and post some Tweets and then keep up to date and then do all of that it’s all great but you have to grow the fans on the fan page. Nobody tells you how to do that apart from advertising. So for me the biggest win for growing my email list has been advertising and done advertising in multiple different ways. I’ve done advertising on Pay Per Click, so that is, you know, paying for ads on Facebook that show up and lead them directly to my free reports. I’m always giving away the free reports, I never talk about my products, I never talk about my services, I never talk about my emails, I just talk about my free reports. And so long as people find my free reports and sign up they’ll get on my list, then it’s up to me to write those emails. So Pay Per Click advertising. And the second thing I’ve tried, which has worked really well for me, is Solo Email Blasts. So I’ll go out there and find people that have databases of people that are in my target audience, entrepreneurs, small businesses and I ask them, you know, to mail an endorsement email to their database that I’ll pay them for. So I’ll pay, you know, if they promise me a thousand clicks—I usually try to buy with the clicks, if they promise me a thousand clicks onto that link which goes to my landing page basically, then, you know, I might pay four or five, six hundred dollars depending on who I’m talking to. And I’ll pay for that because I know that my landing page converts really well with endorsement emails. There are times when, you know, if somebody mails out for me and they get a thousand clicks I’ll probably convert four to five hundred, maybe sometimes six hundred of those people as new subscribers. So I definitely grow my databases like that. But I never knew at first, you know, part of doing traffic is know whether it works. Because you can spend as much money as you want and if it doesn’t work for you then, you know. You may be getting people into your email list but when I say if it doesn’t work I mean, if you’re not seeing sales as a result of those people that have come onto your email list then it’s pointless. Kaveat Harrier: Otherwise I’m just writing email all day long and as great as it can be and as engaging and entertaining as the emails are you still aren’t proving yourself with what you know. Kaveat Harrier: So I do the webinar, I do the blog as tools in-between to convert—I write a blog every Thursday, like an article. So essentially I guess the traffic, solo ads and Pay Per Click are the two biggest things and then what I do is I also buy databases like recommendations I buy mailing lists. Kaveat Harrier: “We’d like you to come and get it, here’s the URL.” And that’s it. it’s usually a single sided postcard, the back of it just has their address and it goes in their mail and it’s delivered offline. And the reason for this is, and it seems to work really well, and the reason for this is because in my opinion is that people just aren’t receiving that much mail anymore. And if they are getting mail then they’re not getting mail that promotes this kind of stuff so it stands out. And it’s really, you know, simple. It’s a big headline with the URL and the picture of the report, there’s nothing more to it. Kaveat Harrier: And people just pick it up and they go—and so therefore because there’s nothing much to it by the way, it’s also really cheaper for me because all I’m doing is printing a black headline, a URL with a picture on like a yellow or a white card and I’m mailing it out. Kaveat Harrier: And I mail out a thousand at a time and I’ll see the kind of results I get. Every URL I try to keep it different I try a code and see what results I’m getting. And then sometimes if those people haven’t responded I’ll do a second mail to the same list just because, you know, two hits is better than one. Seeing an ad twice is better than seeing it once, which is also why daily email works really well. So that’s what I’ll do, and those are my three methods that I really focus on to just grow my list. And I know that if I grow my list and if I keep writing email—because it’s a system because it’s all proven to work essentially. And everybody can do this as long as you’re growing a list, as long as you’re writing email, you’re gonna generate income. John McIntyre: I like that, I think it’s a good note to end on. As long as you’re, you know, writing emails, generating lists, doing all that stuff, you’re gonna make some money. Gonna make some money. Kaveat, man it’s been good to have you on the show. Kaveat Harrier: Yeah, well thank you. Thanks for having me. John McIntyre: Before we wrap this up though, I know you’ve got your service so tell me a bit about that and where people should go if they’re interested in learning more. Kaveat Harrier: Oh yeah, cool. I appreciate that. The service is called Automated Business System and it’s really about taking anybody who has a business idea or who’s tinkering with a business idea, they’re not sure if it’s profitable. We sit down with them we work through that whole process to make sure it’s really profitable and we’ll plan out what they’re business model should be and then my team—I have a team here of a lot of different designers, developers, et cetera and they basically work together to build the entire business and launch it. So once the business is launched within about six weeks we work together, you and I, to market your business. So we learn about all the different strategies that are required to grow it and our goal is to get you to a hundred K in a year. It’s very simple and straight forward. But what I’d like to offer actually, John, is I have a CD that I recorded, it’s called How to Launch Your Business Online and Make Six Figures in a Year. And in there I walk through this entire process in a lot more detail with a lot more, you know, tips and contents so somebody could actually potentially start a few things on their own. So I’d like to give that CD to your readers or your listeners for free actually if that’s ok.
John McIntyre: Sure it’s ok.
Kaveat Harrier: Yeah, insiderinternetsuccess.com/freecd so that’s www.insiderinternetsuccess.com/freecd, you can get that mp3 as well as that CD from there. John McIntyre: Awesome, awesome. I’ll have a link to that in the show notes at the mcmethod.com in the podcast in the show notes right there. So, Kaveat, thanks again for coming on the show, man, it’s been good. Kaveat Harrier: Yeah, I really appreciate that, it’s really good to speak to you.